Mingtai ZF700 halogen Shadowless Lamp overall reflect system is made by CAD/CAM technology, its illumine depth is 1000mm. And it full close streamline light body design completely meets the operation room`s requirement of sterilization and high standard of laminar flow. The doule control system and Li battery are optional. 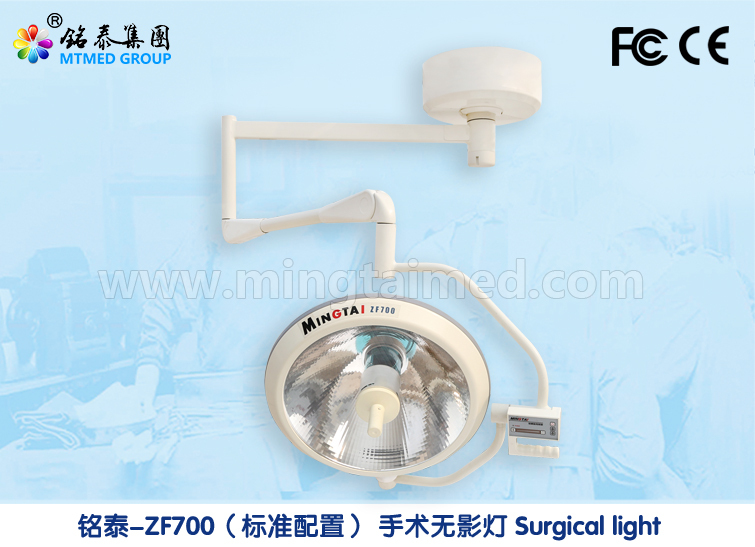 ZF series Surgical Light suitable for different surgery lighting, is the ideal light equipment for modern operation room. 2. Overall reflect system is made by CAD/CAM technology, its illumine depth is 1000mm. Adopting Germany long life halogen bulb, life can be up to 1500 hours. Looking for ideal Ceiling Shadowless Lamp Manufacturer & supplier ? We have a wide selection at great prices to help you get creative. All the Ceiling Operation Lamp are quality guaranteed. We are China Origin Factory of LED Surgery Ligth. If you have any question, please feel free to contact us.